Seth's now created two separate bell curves with a dip in the middle. Convenient for him, he has a book called "The Dip" that's been out for awhile. While this tends to explain his world-view, it may not be correct for all circumstances/situations. I've earlier covered about the Product Life Cycle (which is explained various places), adding that such a marketing cycle (bottom is against time, not attitudes) can be restarted. With Godin's double curve, he assumes a time function at the bottom as well. So he then has your product moving through the first, into the dip, and then into the second. In both Bell Curves, your mainstream is at the top. Mainstream passionate, and mainstream pop. For both cases, your supply/demand then peaks (with least profit) at that point - for that set of public. For many product life cycles, the early adopters are those "dweebs" on the "cutting edge". Gladwell talks about this in "Tipping Point". Artsy Greenwich Villagers who liked Hush Puppies started a new product life cycle trend (which lasted years), but then got out of that trend when it went mainstream. Jeans were a necessary point early on of those passionate about gold-mining in California. Later, other trades found that durable work pants fit their operation as well - that niche was expanded. When they became a fashion statement during the hippy '70's, they became mainstream - and all sorts of people started branding their own. And extensions to this, such as Dockers and what not, gave the same durable easy wear some status as they could pass for corporate wear as well. While you could have a dip in the middle, you could also simply have the early adopters being the passionate and the pop-cycle taking up the slack (and probably causing the slack) in the passionate demand. Dips are also seasonal, sandals don't sell well in winter - but also, high gas prices could keep more off the beach - or more going to the beach. A dip for one area would be a peak for another. Charles Haanel's "Master Key System", Wallace Wattle's "Science of Getting Rich", and Napoleon Hill's "Think and Grow Rich" - these continue to sell well, helped by Rhonda Byrne's "The Secret" DVD, and a host of lecturers who discovered people still bought these books and wanted more information about them. But look through eBay and you'll see that these books are being bought regularly for decent prices as more and more re-discover them and then want more data. Sure, they were in their hay-day during the 20'2 and 30's - but have gone on to sell way more copies than they ever did to begin with. But don't think they had that much of an extreme dip in between - the 50's had a lot of self-help going on (Nightingale-Conant developed during that time and the early 60's). This particular dip would be due to generational differences. The passionate are not always the first bell curve in the sequence. Specialized niches can "discover" a product and start using the hell out of it way after it's fallen off the "pop" radar. Velcro has tons of uses, but has never replaced buttons or any other fastener - except in certain niche products. Now, that Bell Curve isn't really just 2D-flat. It's actually more of a bump, with niches and passions on every side. And that bump wouldn't necessarily be smooth - as you might have mini-dips as your product transitions from one niche to another, going out of style over here while ramping up as popular over there - and there. Against time, you might find that a certain passion-niche remains steady for demand of an item (like farmers and their jeans - they've become consumers of the cheap and durable) - so you have a tunnel-effect throughout the overall life-cycle. Demands for gold-miners peaked years ago, and there certainly aren't as many farmers as their used to be, but people have gardens and like to go outdoors and so need durable pants-type clothing. A 3D graph colored by niche would show all sorts of amazing interactions. But no one goes this way, so we'll leave that be. 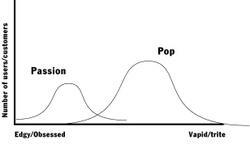 Passion and Pop are just different niches. One's contraction is another's expansion, dip or no dip. Don't figure that the passionate are always first. But there is always early adopters for every niche, as well as late adopters. And, as always, product life cycles can be re-started through brilliant marketing - which is, again, creating a market for a product. "The reason you need to care is that gap in the middle. Every day, millions of businesses get stuck in that gap. They either move to the right in search of the masses or move to the left in search of authenticity, but they compromise. And they get stuck with neither."